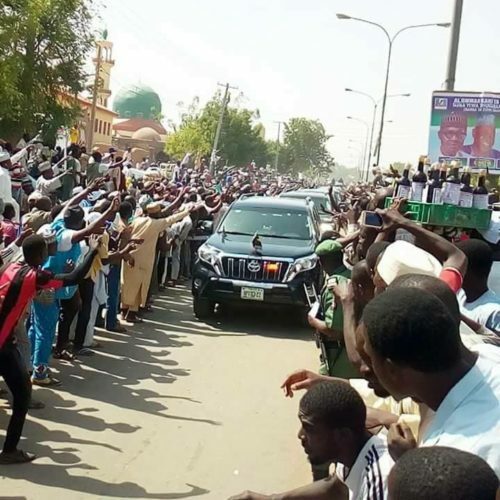 Buhari: My popularity in Kano unshaken – Royal Times of Nigeria. President Muhammadu Buhari on Wednesday night declared that the massive reception that greeted his arrival in Kano for a 2-day working visit “is a message to the opposition’’ that his popularity in the region remains unshaken. Speaking at state dinner held in his honour, President Buhari was full of thanks and gratitude to the government and people of Kano for the very warm and peaceful reception. ‘‘I am overwhelmed with the massive reception I have received and definitely since this is partisan politics, I think it has sent a clear message to the opposition. ‘‘Even going by the details of the election results in 2003, 2007 and 2011, it was very clear that nobody could even dare to rig my scores from the elections in Kano. ‘‘It has been so consistent and I don’t think I have the vocabulary to express my thanks to the people of Kano. ‘‘I am very grateful to God and the people of Kano for the complete trust you have in me,’’ he said. The President noted that during his drive around the city on Wednesday to commission several projects, he observed that many of those who thronged the road to welcome him were very young people. He pledged that as a person in a position of authority, his priority is to provide a meaningful future for the teeming youths in the country through education, and the faithful management of the economy and resources. The President congratulated Governor Abdullahi Ganduje on his development strides in the state and urged other political office holders to emulate and support the state governor. ‘‘He is a great politician and I am afraid I am still learning,’’ the President remarked. President Buhari reaffirmed that his message at his inaugural address, “I belong to everybody and I belong to nobody,’’ will continue to guide his stewardship to the Nigerian people. ‘‘Nigeria is my target and I will continue to maintain focus,’’ he said.